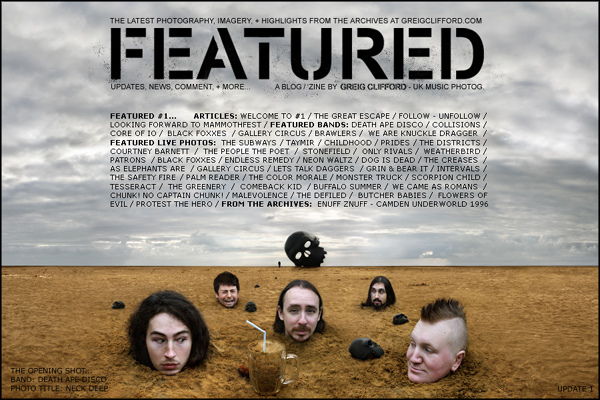 Greig Clifford, UK Music Photographer. FEATURED blog. FEATURED is my blog, to highlight and 'feature' some of my recent images and bring a little extra exposure to the people, bands and gigs I've photographed... and to any publications (online or print) where those images have been used. It also provides an outlet for me to write about my photography in general, about the musical world I operate in, and what I consider to be the latest greatest new music that I have recently heard. As a stand-alone extension to my website it's a way for me to show extra gig photos, images from the archives including any story behind them, and tour or release news from bands I have been lucky enough to photograph. I'm always keen to stay informed of any new things going on with bands I've seen. If you represent a band in my archive and have any updates that you would like me to write about then please feel free to get in touch. Contact details are at the top of the page. All my latest posts are promoted via my social media pages, eventually being compiled to become the next "FEATURED" stand-alone 'volume'. This will then be promoted again via my email list and social media. My previous volume, FEATURED #1, has so far reached 20,000 views. FEATURED #1 (Spring 2014)... The "Opening Shot" is of Death Ape Disco.